← Goldfish in the beauty parlour ? I am pleased to report that the saggy bags under my eyes are holding up well. I can downface-dog and shoulder-bridge with the best of them and still see what is going on. But what, I wonder does the future hold? While ‘the wedding’ was coming up I was happy to add face cement, creams, pastes, powders and all manner of lotions to my armoury for ‘the photos’. I scrubbed and smoothed and splashed. Rubbed and pinched and puffed. And yes, I felt as though it was working…I felt good. 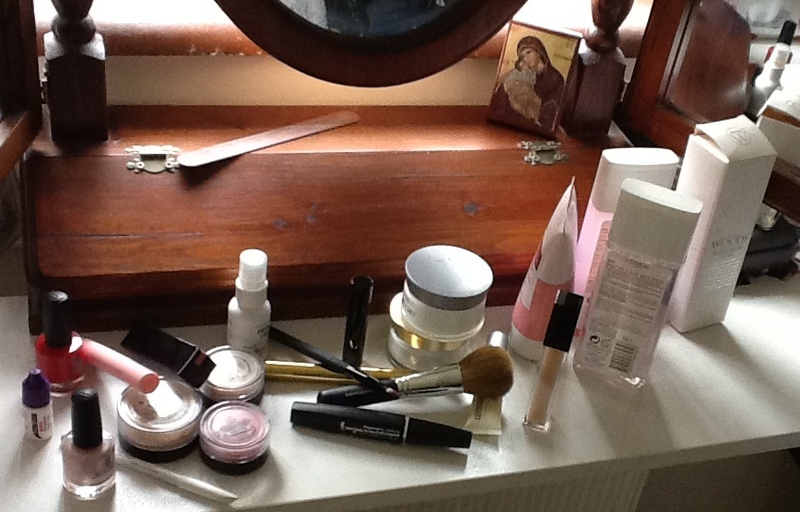 But now, as I survey my once beautifully clear dressing table with its jumble of pots and tubes and brushes and bits that I often ponder for clues then put down still not knowing what they are for…and as I think about the lack of bags I ask, is this the way it will always be? Gone are the days of a quick splosh about in a basin of warm water, or face up under the shower head. I find I am scared – is that too strong a word? Well, mildly concerned at least, that if I suddenly stop with the routine – which I might add also puts paid to my ten minute dash from duvet to front door – my face may fall off! NB the religious icon beside the mirror is a belt and braces thing! This entry was posted in ageing, beauty treatments, Life writing, lifestyle and tagged ageing, beauty products, beauty routines, eye-bags, lifestyle. Bookmark the permalink. 1 Response to and after the goldfish…?